Bryan Gruley doesn’t just walk into a room. He saunters. He blusters. His energy explodes in the doorway. His six-foot-two athletic frame commands attention. Heads turn. He is somebody. And he’s used to this. As a nationally renowned reporter—seven years as Chicago bureau chief of the Wall Street Journal and as of September with Bloomberg News—and now also a best-selling author, there isn’t very much in his life that’s about keeping a low profile. We meet in Northern Michigan in early January, on a day when the roads are nearly impassable because of blinding snow. The venue is Short’s Brewing Company in Bellaire, about 40 miles northeast of Traverse City. This microbrewery and this town are among Gruley’s favorite haunts in the north. In fact, all three of his novels take place in a fictional village called Starvation Lake, which is based on the town of Bellaire. The real Starvation Lake is a 125-acre lake in Kalkaska County, just outside of Traverse City, mostly known for its trout fishing, and a quintessential Northern Michigan bar called The Hideaway, where Gruley concedes he’s spent quite a bit of time. Gruley shakes the snow off his North Face jacket and orders a Short’s microbrew—a Locals Light lager. Settling into a bar stool, he explains he’s fresh from playing an alumni game of ice hockey with former classmates at his high school in Detroit. He still plays amateur ice hockey regularly at Johnny’s Ice House in Chicago. Each year he brings a group of his hockey-playing pals up to his father’s place on Big Twin Lake for a gathering that’s called The Pistachio Open. The day we meet, he’s just completed 92,000 words of the third book in his mystery series. It’s called The Skeleton Box, due to be published in February 2012. “Who are you going to kill this time?” I say. “Darlene’s mother,” Gruley answers matter-of-factly. The people sitting at the bar turn to look at us. Gruley doesn’t care. He wraps an athletic hand around the glass and takes a deep swig in a way that lets you know he’s done this quite a few times before. Then we begin talking about how it is that he came to write mysteries based in Northern Michigan. It’s clear from the get-go that though he has enjoyed his job as a journalist for most of his professional life, he is relishing his role as an author. And it’s even more satisfying for Gruley because the three-mystery series combines four of his passions: Northern Michigan. Newspapers. Amateur ice hockey. And intrigue. The first two books in Gruley’s mystery series, Starvation Lake and The Hanging Tree, were published in 2009 and 2010 by Touchstone Books, an imprint of Simon & Schuster, and won solid acclaim. Starvation Lake won the Strand Magazine Critics Award for Best First Novel, and The Anthony Award and the Barry Award for Best Paperback Original. The Hanging Tree won the Barry Award, as well as the 2011 Michigan Notable Book Award and was chosen as the No. 1 Indie Next Pick for August 2010 by the American Booksellers Association. Starvation Lake is about a mysterious disappearance of a youth hockey coach, which happened long ago. The novel begins when the missing man’s snowmobile washes up on the icy shores of Starvation Lake. Gruley’s second book, The Hanging Tree, is about a woman who is found dead of an apparent suicide. Her body is found hanging in a tree filled with shoes, very much like the tree on U.S. 131 in Kalkaska. The third book, The Skeleton Box, revolves around the discovery of a dead nun’s bones, inspired by a real-life Northern Michigan murder that happened in the early 1900’s in a church near Cedar. Gruley was born and raised in Detroit, went to Detroit Catholic Central, then the University of Notre Dame. His first newspaper job—an internship—was at the Antrim County News. That’s where he got his first taste of what it was like to be a newspaperman in Northern Michigan, and the experience planted the seed of the main character in all three novels. From the Antrim County News, Gruley moved on to newspaper jobs in Brighton, Howell, Kalamazoo and Detroit, and then the Wall Street Journal in Washington, D.C. When he moved to Chicago in 2005, he became the journal’s Chicago bureau chief. He lives on the north side of the city, near Wrigley Field, with his wife, Pam. As you read Starvation Lake and The Hanging Tree, it’s clear this writer pays attention to the smallest detail. His characters are clearly drawn. So are the places he tells his stories: the smells, the feel, the sounds. The game of ice hockey is like a full-blown character in each of Gruley’s novels. So are icy cold Northern Michigan winters. He even made a detailed map of the fictional town he created based on Bellaire. He pulled the wrinkled, well-worn piece of paper with scribbles on it out of his pocket as we sat at Short’s, and then we went outside in the heavy snow as he pointed out each spot that inspired the fictional town of Starvation Lake. He stands in the middle of the street, pointing out the places he created in his mind as if they were real, clear as day, in front of him. It’s as if he’s directing a play or a movie. Or maybe, it’s more like he’s playing God. Snowflakes fall all around him, piling up on the shoulders of his jacket. He hardly notices as he talks excitedly and gestures to the streets and apartments; the town he created in his head that is now familiar to thousands of readers. You can tell he has taken the time to make it all fit and make it right. 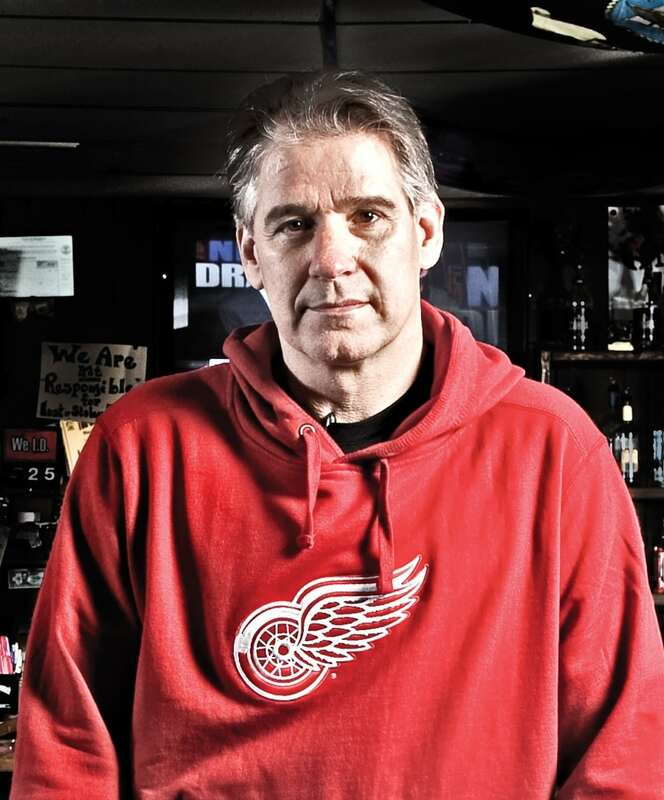 So some winter day, perhaps in January, if you see the lone silhouette of a man, wearing hockey gloves, holding his stick, shooting a puck at an imaginary net at the end of a pond somewhere in Northern Michigan, it’s probably Bryan Gruley, looking for new inspirations for his next novel. And thinking about the next person he’s going to kill. This story is featured in the October 2011 issue of Traverse, Northern Michigan’s Magazine. Subscribe.